Despite 400 years of powering Japanese industry, of mining, processing and shipping one of the most essential early industry elements in some of the hardest and most dangerous conditions around, Ashio is remembered far more for its flaws than for its accomplishments. Ask any Japanese about Ashio, and they’ll give you a response straight from their high school history textbooks: in Ashio Japan learned the true cost of industrialization, that of crippling environmental damage, as sulfuric acid from the factory’s numerous smelter chimneys coagulated in the atmosphere and fell as acid rain, poisoning the water table and blistering the mountains so all plant-life died. 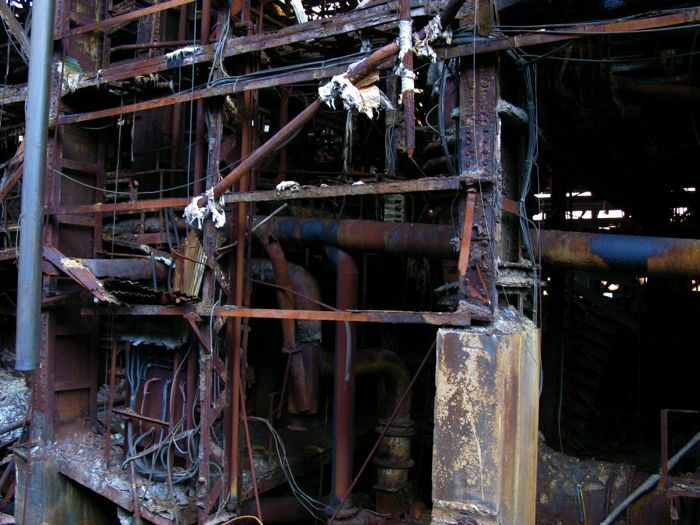 Red bones of the factory, what’s left after acid rain stripped away the skin. 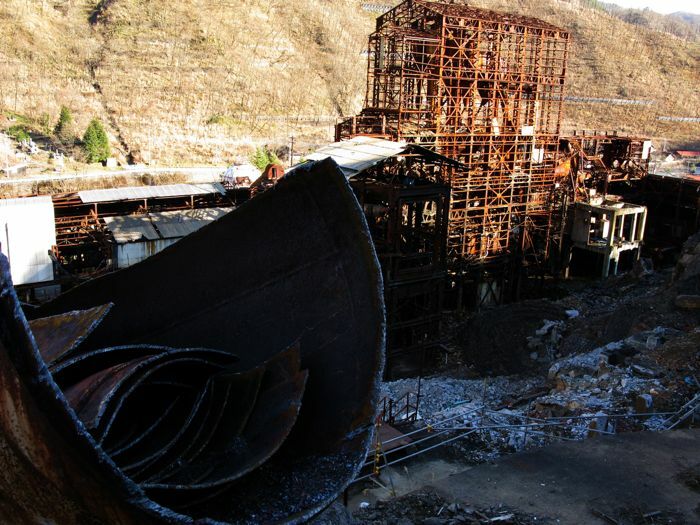 Copper is extracted through a two stage process: first the copper minerals, with around 0.5 – 5% copper, are left to steep in a vat of acid called a heap or dump leach for a few days; and second, the remains are smelted to purity at a temperature of 1200 Â°C, unleashing huge amounts of sulfuric acid gas. 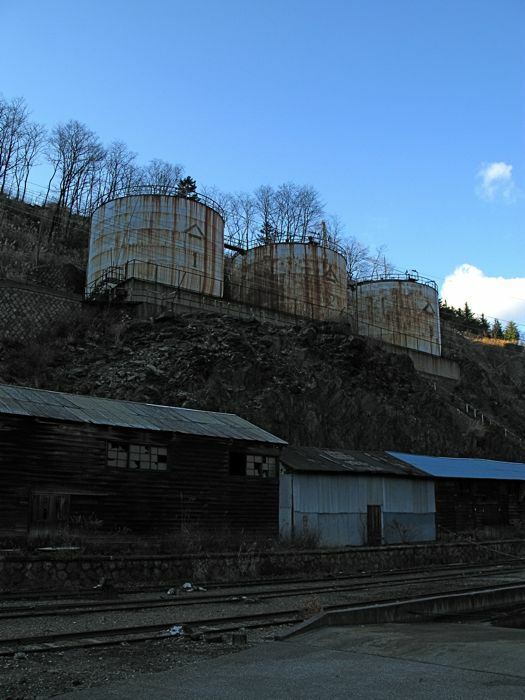 The factory and bald mountain, ravaged by decades of acid rain. The factory was the last thing Su Young and I investigated, despite it being one of the first things we saw, looming up over the valley as we approached, squatting up against the bald mountains from across the river as we went by. The reason for that was how secure the facility was, how close to the main road it was, and how live it appeared. 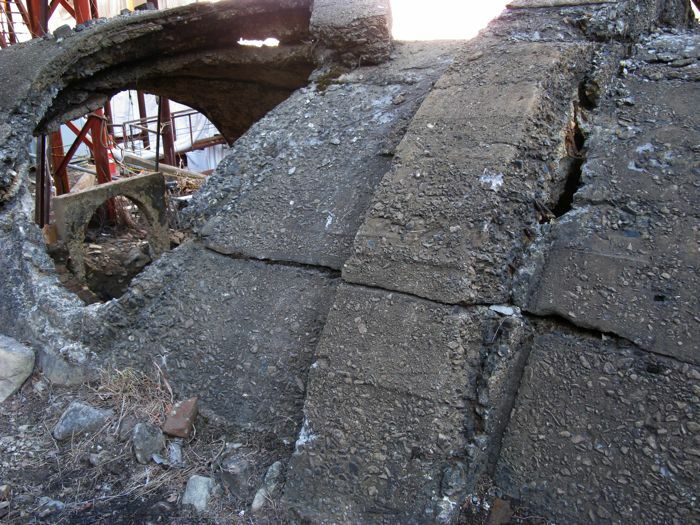 Of course it had a fence, like the mine and the power hub did, but the fences on the factory were intact, tall, and pretty much unclimbable without risk of injury. There was a new road going down to the factory front, with a new security box and new car-crunching fence across it. In the factory forecourt were cars, and earth-moving equipment, and vending machines. Almost the whole complex, with new buildings at the front. So, we decided to bypass the well-guarded front. We went up the side-road that promised to loop behind the factory, and perhaps offer opportunities to get on the bluff above it and come down. Up that side road is where we found the power hub, then the mine, then shrine. At the top, the road gave off at a very live fence, with a security guy telling us to turn around. The road beyond that point hadn’t been built, or had been destroyed. I’ll guess this open space was where the more modern Ashio town had been. Gone now. Going back down the road, it branched- one fork heading back the way we’d come, and the other shooting off and curling up the mountain. I assumed it must head to the back of the factory, but it was also well fenced, with a lot of signs, and was the same fence we’d heard a security guy earlier open and close while we were hiding in the mine complex. We debated for a while, then just decided what the hell, we’d come this far, we had to at least try. So, I hoisted the bikes over the fence, and off we went. The road snaked upwards with the mountain, soon affording us a view over what remained of Mato town, then plateau-ing out in a wide-open car-park type space, dotted with strange square holes in the tarmac. I’ll guess it was once a huge warehouse, but I’m not really basing that on anything. We raced to the far side, past a few empty security boxes, veering round the weird deep holes, and at the edge found ourselves looking down on the back of the factory. We savored the view for a moment, then laid down our bikes to deter detection, and, hearts racing at the thrill of it all, began our descent down the rickety metal staircase. Looking down at the factory from behind, well-screened from the road, alongside a big slurry-pipe. 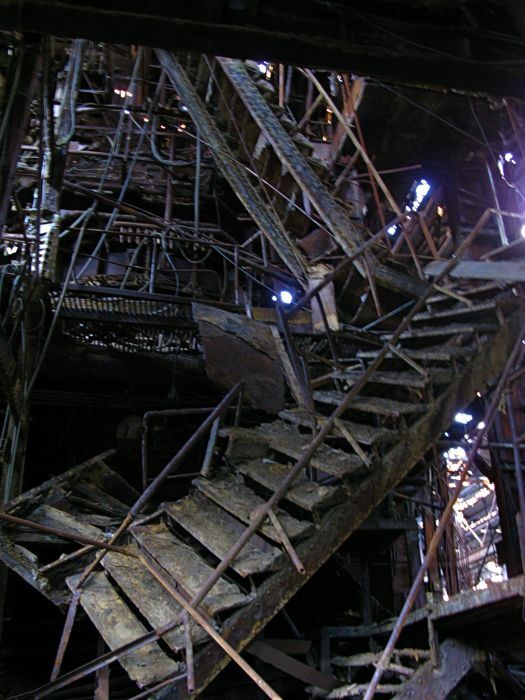 Racing down the stairs, we emerged into ruin and melted behind cover. In the shadow it was bitterly cold, and we kept moving to ward off the frozen tingle in toes and fingers. 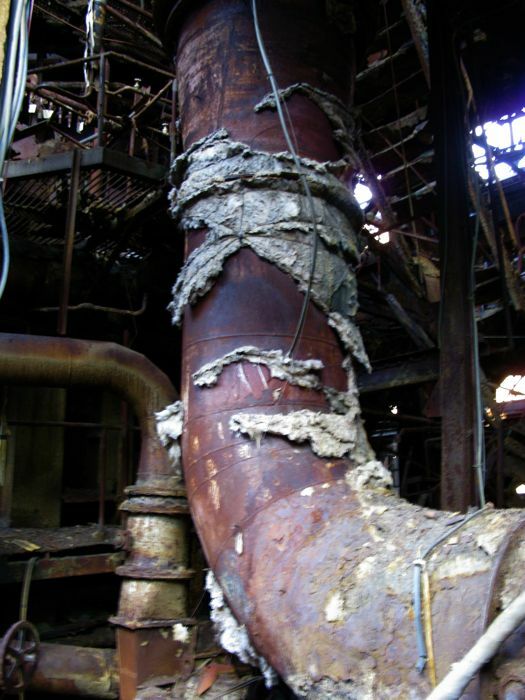 Here were immense concrete pipes smashed through, looking into silos piled up with some ancient crusted chemical, there the great rusted side of the factory had been peeled back to reveal the russet pipes and frayed wires of its musculature and nerve system. 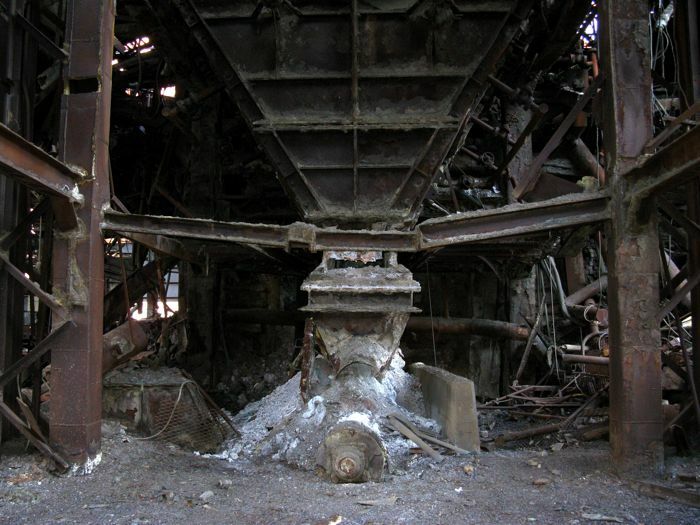 Together we darted from the cover of great iron casting buckets to the elevated rail station buried within the factory’s bowels, eyes constantly turning to the road without and all the buildings were we could see people moving within. Though the worst they would likely do is simply kick us out, when you’re in the thick of the explore, taking photos manically, thirsty to see everything, that threat looms huge. It’s the difference between success and failure. So we continued sprinting around, over lifeless chemical puddled ground, in awe at the scale of the rotting hulk around us. At times it felt like standing in the corpse of some giant, long-dead beast. A huge concrete pipe lay waiting for us at the bottom. Actually I suspect this was a leaching pit filled with acid and copper slag- since inside there are various chambers, and it’s massive. 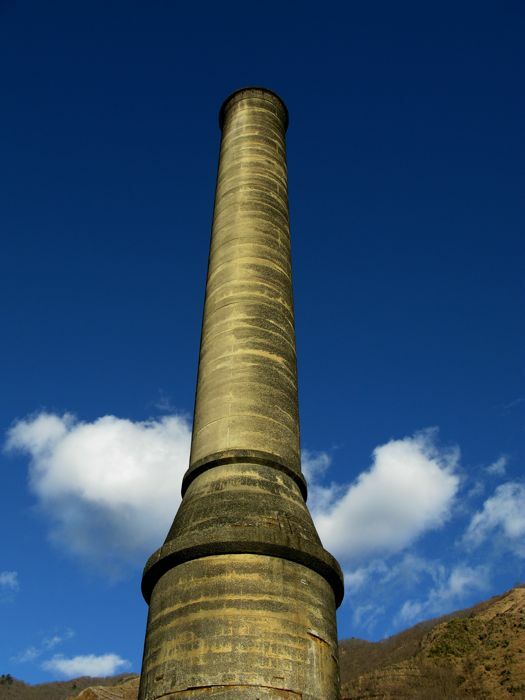 The one remaining smelter chimney. The red metal factory wall. My favorite shot of the whole endeavor- I assume part of the smelting process. Race you to the top. 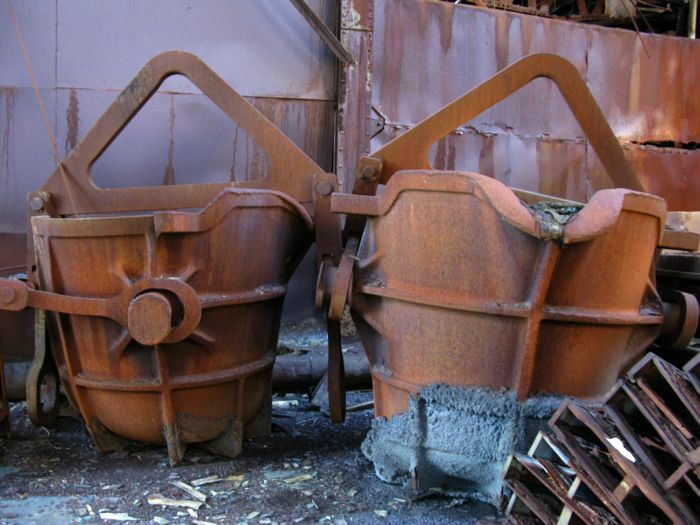 Two huge buckets, I assume for carrying molten copper to be cast. 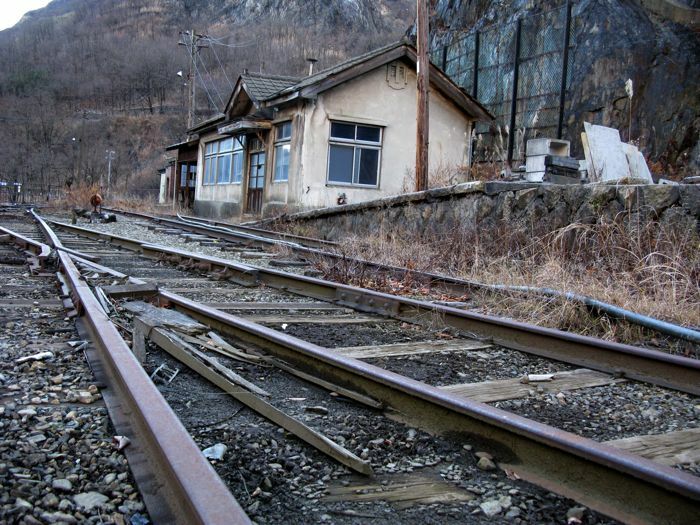 After about 30 minutes of wandering the factory freely our confidence was up, and we figured it would be safe to venture out into the train station area, connected to the factory. This place was much more easily seen from the street- but to be honest there wasn’t really anyone on the street anyway, so I suppose it was quite secure. 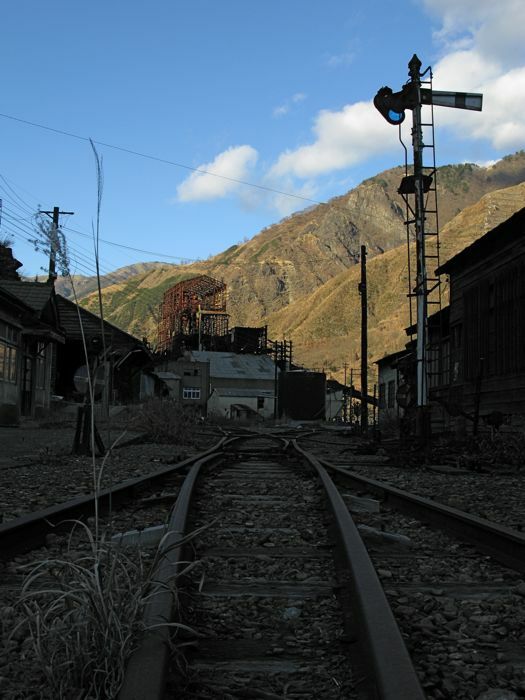 Looking over the terminus station of the old Ashio line. And that’s pretty much it, really. We climbed back up the mountain-side, got back on our bikes, and headed off. At the fence we did bump into a security guy, but I just bulldozed us past him and over the fence before he could really register what was happening- he’d been re-locking the fence behind his car as we sped towards him, so hadn’t seen us approach. He was pretty taken aback when he did see us, and I managed to get my bike over the fence and was working on Su Young’s before he was able to blurt out- “you shouldn’t be in here!” I looked back as I lifted the second bike over and said “So desu ne, sumimasen” (Sorry, yes you’re right), then we were off. We free-wheeled down the main road back to Mato train station, where we waited in the waiting room- of course just the two of us- for one hour, drinking hot cocoa and corn soup from a vending machine, waiting for the train to come take us home. Hope you’ll do videos during your future haikyos, maybe without music so that we can feel the quietness of the place as you do. 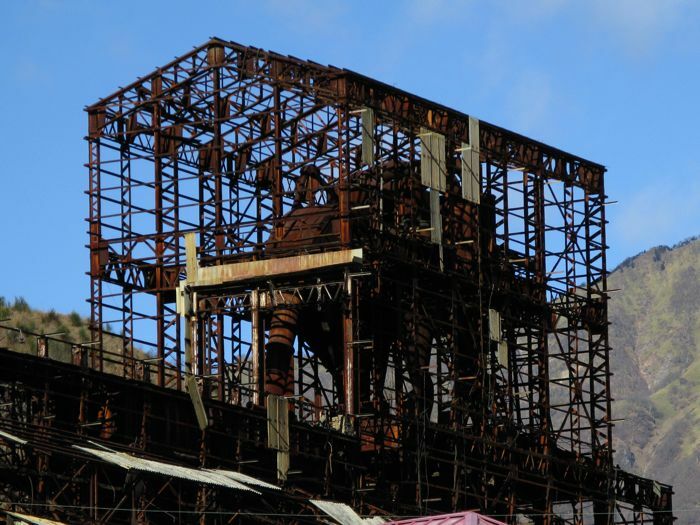 I can’t get over my first impression that an elephant appears to be caged in the remnants of the building in your first shot. I like the shots of the train tracks the best though – they would probably look great in black & white and really capture the feeling of the place. Very interesting, effective photo-essay. Thanks much. Look forward to checking out more of your site. Cool. 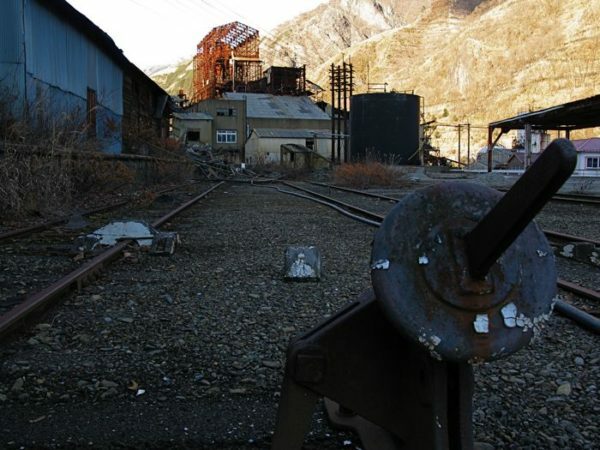 I wonder why there is security for a seemingly abandoned mine complex? Who do they work for? The government? Why doesn’t the government clean this place up I wonder? Very nice set of articles, some of the pictures you took were amazing and the video was a nice addition. I echo the sentiment about the music though, maybe either choose a quieter track or have none at all. Look forward to seeing more from you. I like the crashed staircase shot. Looks like a cool interactive (i.e. switches and stuff) haikyo location. Andy- Thanks, and my pleasure- I’m glad people like this stuff cos I love to do it. 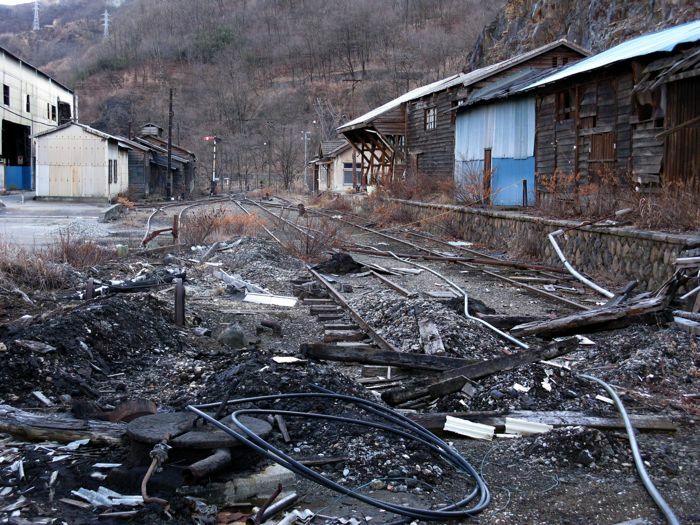 In Cornwall you’re talking about other closed mines right, are there also ghost towns there? Shane- Elephant, wow, I wonder what we can decipher about your personality from hearing that? 😉 Black and White right- I’m sure you’re correct, it’s something I’ll probably experiment with. Next haikyo- coming up soon. Tom- Thanks for your thanks- am glad it resonated with you. Billy- Ha, good call- I haven’t seen the movie so don’t know the music from that, but checked the soundtrack via web and yes, it is indeed Autorock by Mogwai, from the album Mr. Beast. You have a canny ear, sir! Adam- Thanks, and ditto to what I said to Jean Rob above, glad to hear I can speed up my video production by removing music, by popular demand. Jason- Thanks, when I saw those stairs I totally thought- money shot! It didn’t come out as in-focus as I’d have liked, but still it works I think. 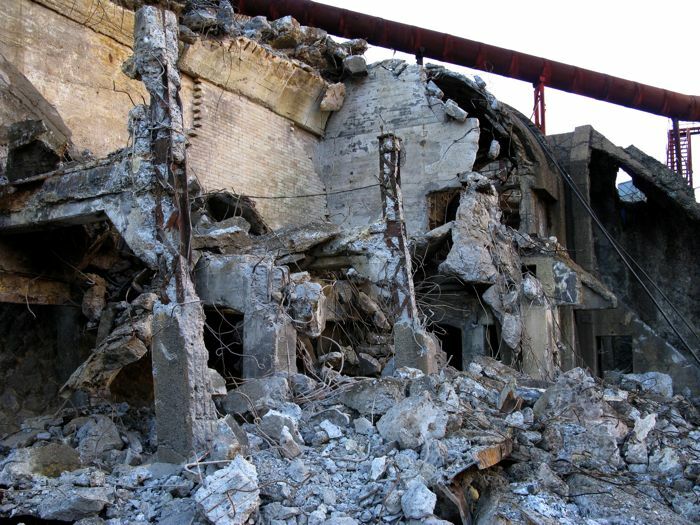 Hi guys, we want to go shoot at ashio this weekend (april 12th 2009), we heard a rumour that the place has gone, been torn down – can anyone give us a latest update? by the way – can anyone give me some advise on places to shoot an art/music video in, Ashio is our first choice, but need some ideas for a backup, within a few hours drive from Tokyo. 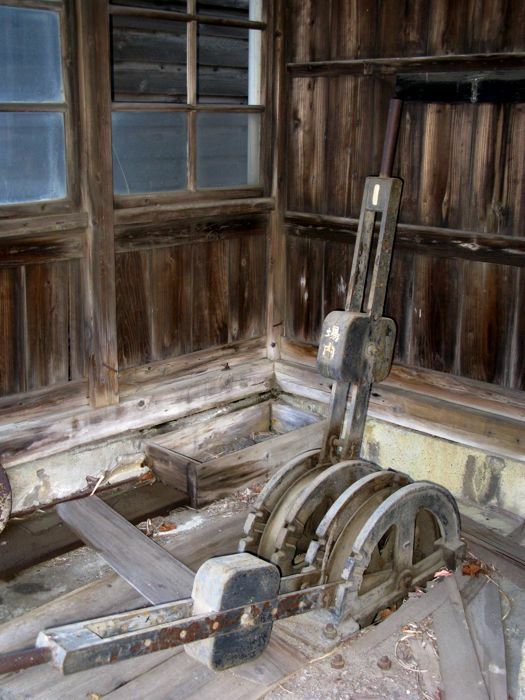 I love the piano type music you used for the video of the Ashidozan Ghost Town 4 page. What was it? I’d love to find it somewhere. great adventures. I’ve done some urban exploration in my city and the thrill of being there, surrounded by the past makes me always imagine what was goin on when the place was new. Rickerz- Hey, sorry I never replied to this, hope you got the footage you wanted. Dave- The music is Autorock by Mogwai, from the album Mr. Beast. Glad you like it and the site. Hopefully nothing much has changed here, I was planning to head there this weekend with a japanese friend of mine. I’ll have to do some serious talking to try and convince her to “break the rules” and climb a few fences, but I should be able to manage it. Still a fun trip, got many nice landscape photos and shots of some other stuff, but it already feels tourist-y. Richard, at the factory complex? Thats a surprise because theres already such an attraction downstream. 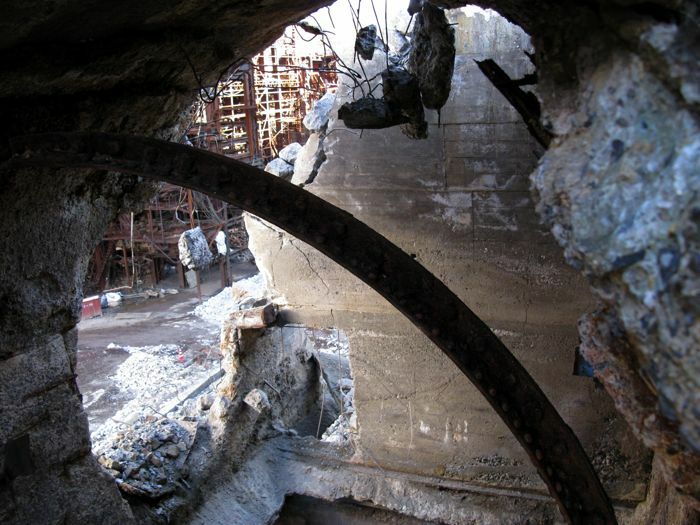 The mine has two entrances. North-East and South. The South one where the river runs E-W is very touristy and has a little mineralogy museum out the front and a even silly little minecart you ride from the admission booth to the entrance. The North-East entrance, where the valley runs more N-S is where these pics are from, at the stop the local train no longer goes to. There are about 5 elderly residents living there at a guess in a newish “manshon” building, serviced by the town downstream and a lone vending machine overlooking the factory complex. Apart from that, it was basically ALL haikyo up in Ashio proper when I went last year. Of course, the world heritage status thing doesn’t surprise me. Japanese haikyo blogs have been scathingly critical of Tottori? 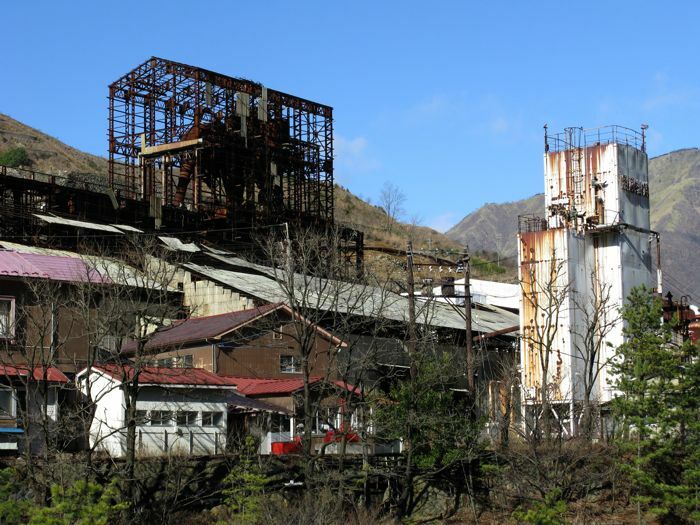 prefecture somehow nabbing the status for their silver mine back in 2007, alongside many disappointed reviews from tourists. It slipped into the list, through many people’s eyes, without truly fulfilling all the UNESCO criteria. Its become the laughing stock of the list. So knowing that something uninspiring can slip by, the truly outstanding sites like Ashio and Hashima are now seen as pretty much a gimme. 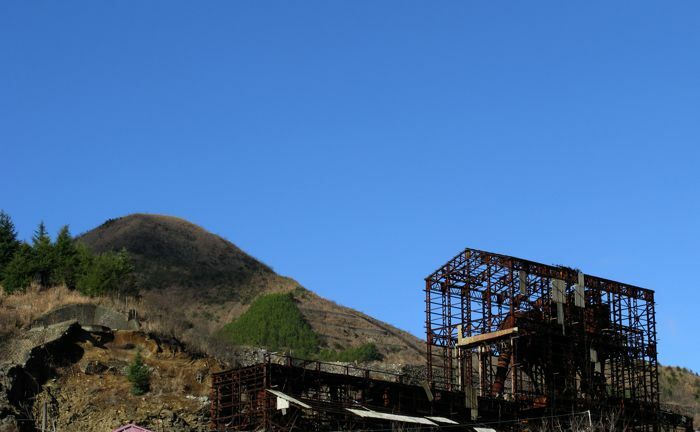 Espcially given the impressive mark the Ashio site has left on Japanese history via the pollution problems (in Hashima’s case, it’d be the human population density world record they set there).